Ki-84s and Ki-43s photographed on a JAAF base in Korea post-war. The Ki-84 in the foreground is from the 85th Hiko-Sentai, the next one in line belonged to the 22nd Hiko-Sentai HQ Chutai. Design of the Ki-84 commenced in early 1942 to meet an Imperial Japanese Army Air Service requirement for a replacement for Nakajima's Ki-43 Hayabusa, just entering service. The specification recognised the need to combine the maneuverability of the Ki-43 with performance to match the best western fighters and heavy firepower. The Ki-84 first flew in March 1943. Although the design itself was solid, the shortage of fuel and construction materials, poor production quality, and lack of skilled pilots prevented the fighter from reaching its potential. 3,514 were produced. The Ki-84 addressed the most common complaints about the popular and highly maneuverable Ki-43: insufficient firepower, poor defensive armor, and lack of climbing power. The Ki-84 was a cantilever low-wing monoplane of all-metal construction, except for the fabric-covered control surfaces. It had retractable tailwheel landing gear. Armament comprised two fuselage-mounted 12.7 mm (.50 in) machine guns and two wing-mounted 20 mm cannons, a considerable improvement over the single 7.7 mm (.303 in) and single 12.7 mm (.50 in) machine guns of the Hayabusa. Defensive armor offered Hayate pilots better protection than the unsealed wing tanks and light-alloy airframe of the Ki-43. In addition, the Ki-84 used a 65 mm (2.56 in) armor-glass canopy, 13 mm (.51 in) of head and back armor, and multiple bulkheads in the fuselage, which protected both the methanol-water tank (used to increase the effectiveness of the supercharger) and the centrally-located fuel tank. It was the Nakajima Ha-45 radial powerplant that gave the Hayate its high speed and prowess in combat. Derived from the Homare engine common to many Japanese aircraft, the Hayate used a direct-injection version of the engine, using water injection to aid the supercharger in giving the Ki-84 a rated 1,491 kW (2,000 hp) at takeoff. This combination - in theory, at least - gave it a climb rate and top speed roughly competitive with the top Allied fighters of the late Pacific theater, the P-51D Mustang and P-47D Thunderbolt (with top speeds of 703 km/h/437 mph and 686 km/h/426 mph, respectively). Initial Hayate testing at Tachikawa in early summer 1943 saw test pilot Lieutenant Funabashi reach a maximum level airspeed of 634 km/h (394 mph) in the second prototype, but after the war a captured example was tested by the U.S. Army achieved a speed of 690 km/h (430 mph). The complicated direct-injection engine, however, required a great deal of care in construction and maintenance and, as the Allies advanced toward the Japanese homeland, it became increasingly difficult to support the type's designed performance. Compounding reliability issues was the Allied submarine blockade which prevented delivery of crucial components, such as the landing gear. Many further landing gear units were compromised by the poor-quality heat treatment of late-war Japanese steel. Many Hayates consequently suffered strut collapses on landing. The first major operational involvement was in the battle of Leyte at the end of 1944, and from that moment until the end of the Pacific war the Ki-84 was met wherever the action was intense. The 22nd Sentai re-equipped with production Hayates. Though it lacked sufficient high-altitude performance, it performed well at medium and low levels. 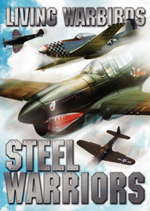 Seeing action against the USAAF 14th Air Force, it quickly gained a reputation as a fighter to be reckoned with. Fighter-bomber models also entered service. On April 15th, 1945, 11 Hayates attacked US airfields on Okinawa, successfully destroying many aircraft on the ground. The Ki-84, Ki-100, and N1K2-J were the three Japanese fighters best suited to combat the Allied fighters. Type N: The entire airframe was left in its original natural metal. Because of the different grades of alloy used for various panels the overall finish soon weathered or oxodised to a pale metallic grey, with variations in shade and texture, depending on the grade of duralumin used for each area of skin. A black "anti-glare" panel was painted on the top forward fuselage and engine cowling (see photo of 73 Hiko-Sentai aircraft). Type S: Three variations were seen on Ki-84s; S1 - Dark green upper surfaces, with light grey/green lower surfaces. S2 - The light grey/green on the lower surfaces was replaced by a pale blue/grey. These colours were often applied on an unprimed airframe; because of this and the poor adhesion qualities of Japanese paints in the latter years of the war this scheme often weathered quickly, with large patches of natural metal being visible (see photo of 85 Hiko-Sentai Ki-84 on a Korean base). S10- The upper surfaces were left in a red/brown primer with the under surfaces in natural metal. The black anti-glare panel was optional. Other schemes were applied, particularly by the Shinbu-Tai "Special Attack" units. For example, a Ki-84 of 57 Shinbu-Tai, flown by Corporal Takano, had very dark brown-green upper surfaces (some sources state black), with a large red "arrow" outlined in white painted along the entire length of the fuselage and engine cowling. White Kana characters "hitt-chin" (be sure to sink) were painted above the arrow on the rear fuselage. The under surfaces were light grey. Factory applied markings included six hinomaru (national insignia), outlined with a 75 mm (2.95 in) white border on camouflaged aircraft, on either side of the rear fuselage and on the upper and lower outer wings. Yellow/orange identification strips were applied to the leading edges of wings, extending from the roots to 1/3rd of the wingspan. It was a general rule that Japanese planes in overseas territories had a narrow white line called the "border break through line" or "field identification mark" surrounding their hinomaru; planes belonging to interception forces in Japan proper placed the insignia inside a white square (colloquially known as the "Homeland Defense bandage"), so anti-aircraft defence units could more easily distinguish them from enemy planes. The inside of the fuselage and the wheel cover wells were painted in a dark opaque bluish grey, and the propeller spinner was painted with a variety of colors based on the unit it belonged to. Version against Bombers, with 2 × 20 mm Ho-5 cannons and 2 × 30 mm (1.18 in) Ho-155 cannons in wings. Manufactured in Manchukuo for Mansyu by Nakajima License. Similar to models mentioned above (Ki-84-Ia, -Ib, -Ic). Prototypes in total wood construction. Prototype similar at Ki-84-Ib in steel. Evaluation model, equipped with Mitsubishi 62(Ha-33), 1,120 kW (1,500 hp). People's Liberation Army Air Force operated captured aircraft from 1945 until the 1950s. Chinese Nationalist Air Force held some Ki-84 in reserve in case American aid was cut. After the war a number of aircraft were tested by the allied forces, two at the Technical Air Intelligence Unit South-West Pacific Area (SWPA) as S10 and S17 and a further two in the United States as FE-301 and FE-302 (Later T2-301 and T2-302). The aircraft now on exhibition at the Tokko Heiwa Kinen-kan Museum at Chiran in Japan is the former S17. This is the same aircraft that used to be found in the Planes of Fame Museum and later in the Arashiyama Museum in Kyoto. 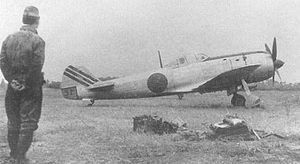 Not many Japanese warplanes survived as a result of Kamikaze operations but there is known to be at least one airworthy Hayate. 1. Glancey 2006, p. 174. 3. Mondey 1996, p. 228. 4. Glancey 2006, p. 174. 5. "The High Wind From Ota". Air International. Volume 10 No. 1, p. 22-29, 43-46. 6. Green, Willam (1961). 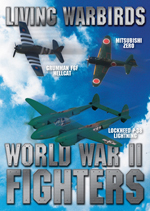 Warplanes of the Second World War, Fighters Volume Three. London: MacDonald. 7. Mondey 1996, p. 230. 8. Mondey 1996, p. 230. 9. a b c d Fearis 1996, p.44. 12. Wieliczko 2005, p. 75. 13. Wieliczko 2005, p. 64-65. Francillon, René J. The Nakajima Hayate (Aircraft in Profile number 70). Leatherhead, Surrey, UK: Profile Publications Ltd., 1966. Glancey, Jonathan. 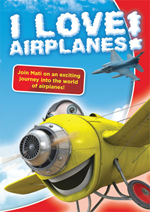 Spitfire: The Biography. London: Atlantic Books, 2006. 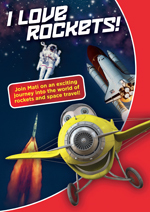 ISBN 978-1-84354-528-6. Thorpe, Donald W. Japanese Army Air Force Camouflage and markings World War II. Fallbrook, CA: Aero Publishers, Inc., 1968. ISBN 0-8168-6579-5. Unknown Author Review in "AIRVIEW". Various Authors. Yon-Shiki Sentoki Hayate (Pacific War No.46). Tokyo, Japan: Gakken, 2004. ISBN 4-05-603574-1.